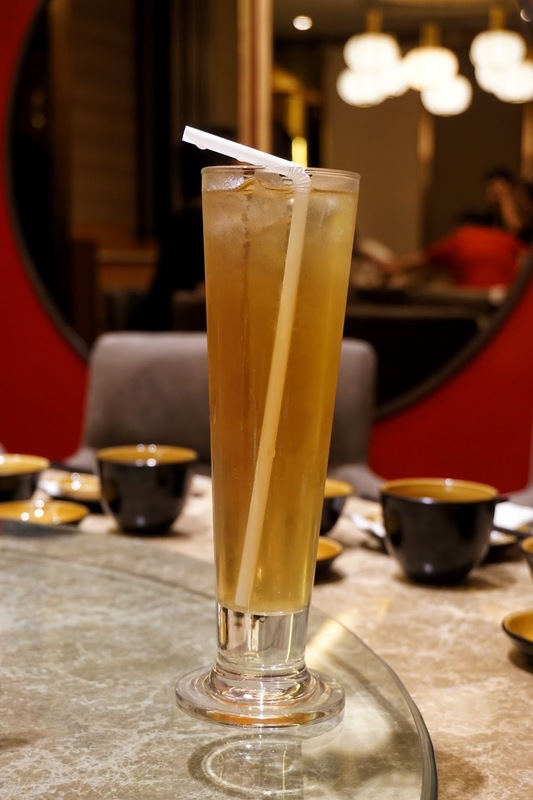 What Mary Loves: Restaurant Love: Paradise Dynasty is now in Podium! Restaurant Love: Paradise Dynasty is now in Podium! 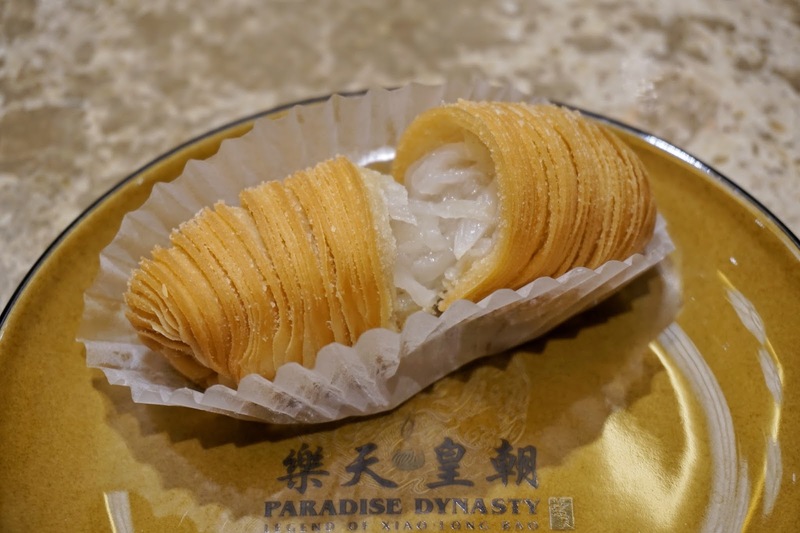 I have been a big fan of Paradise Dynasty ever since they opened in S'Maison. However, the distance has been an issue for me and it was like having a long distance relationship with the xiao long bao that stole my heart from another restaurant known for it. But love moves mountains and Paradise Dynasty finally opened a new branch closer to home. I was so thrilled when I saw Paradise Dynasty in the newly renovated Podium mall. 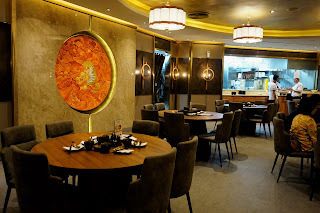 Though it didn't retain the the same interiors that I love from its first branch, this one is equally spacious and offers the exact menu plus more! We dropped by last Wednesday for lunch and the place was packed with diners! It was no surprise though as its S'Maison branch has the same busy lunch scene. 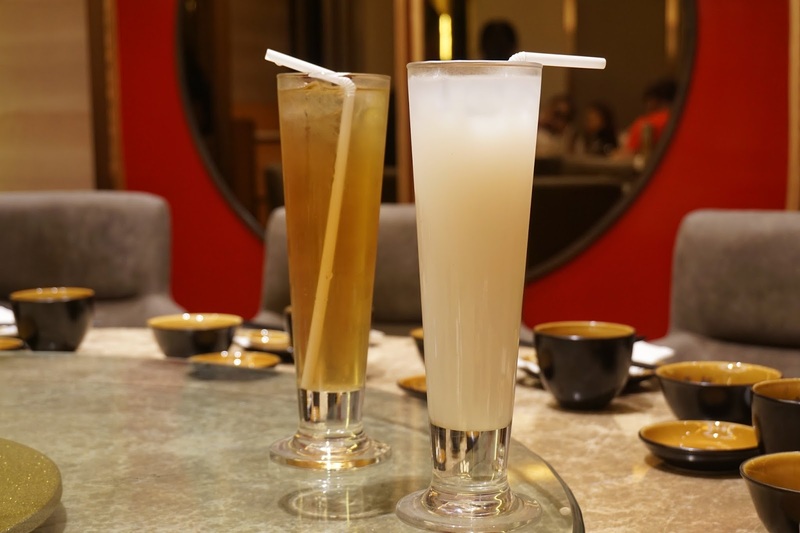 While waiting for others to arrive, R and I indulged in some refreshing beverages namely Water Chestnut (PHP80) and Homemade Barley Water (PHP80). We also had Mango Shake (PHP150) which I found reasonably priced. For starters, we tried Charcoal Custard Lava Buns (PHP188, 3 pieces), Radish Pastry (PHP138, 3 pieces), Steamed Glutinous Rice stuffed in Red Dates (PHP238) and Lettuce Roll with Homemade Sesame Sauce (PHP288). 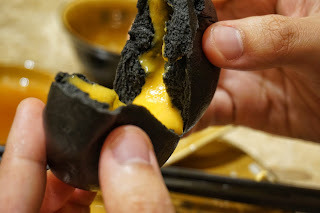 The Charcoal Custard Lava Buns were delicious. 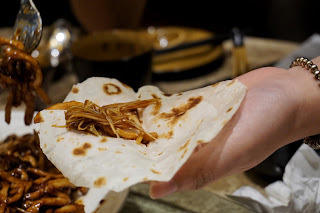 The steamed buns had that perfect texture, dense and quite bouncy. The custard filling had that lovely sweet taste that anyone with a sweet tooth would love. Though part of starters, I wouldn't mind ending my meal with this as well. 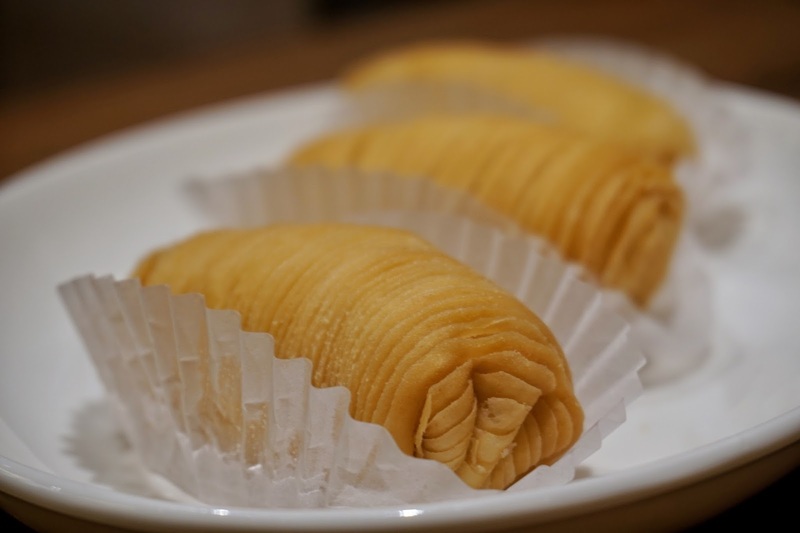 If you want something light on the palate, do try Paradise Dynasty's Radish Pastry. This beautiful and delicate dish stuffed with thin radish strips would be something those who dislike strong and bold flavors would enjoy. 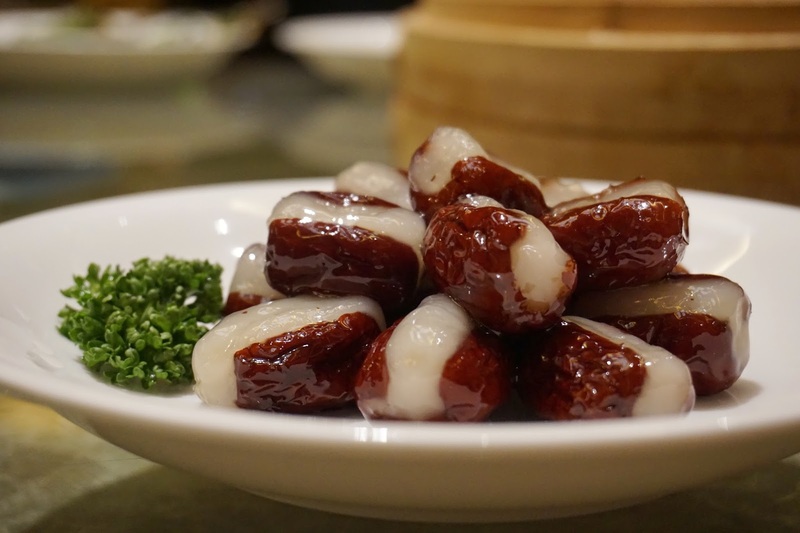 I was surprised that not a lot of people appreciate Paradise Dynasty's Steamed Glutinous Rice stuffed in Red Dates. Though it might be a bit too sweet as an appetizer, this dish is superb in my book. The mochi-like filling and sweet date flavor is a match made in foodie heaven. I could finish half a plate of this at the start of the meal and the other half at the end. 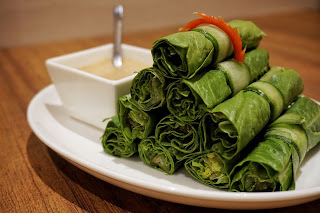 But if you fancy greens more, then you have to order Lettuce Roll with Homemade Sesame Sauce. This dish may look plain but I was surprised to find myself grabbing another serving. 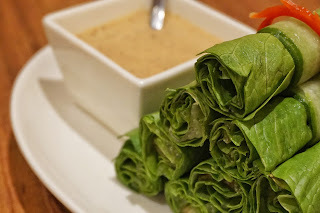 The crunch of the lettuce roll stuffed with cucumber strips was so addicting that I already took a mental note to order this again on my next visit. 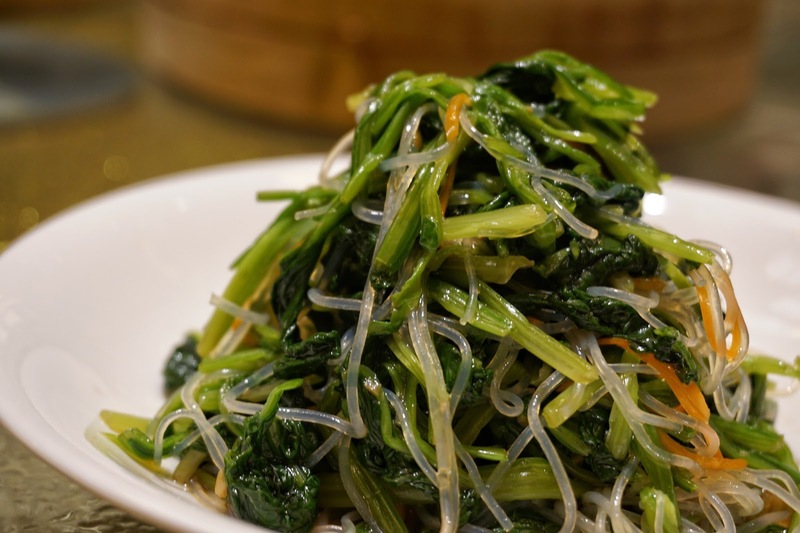 And speaking of greens, you might also want to try Chilled Baby Spinach with Vermicelli (PHP288). This dish is currently exclusive to Paradise Dynasty Podium branch. Though it doesn't give the crunch Lettuce Roll offers, this dish offers more variety in terms of texture and flavor. 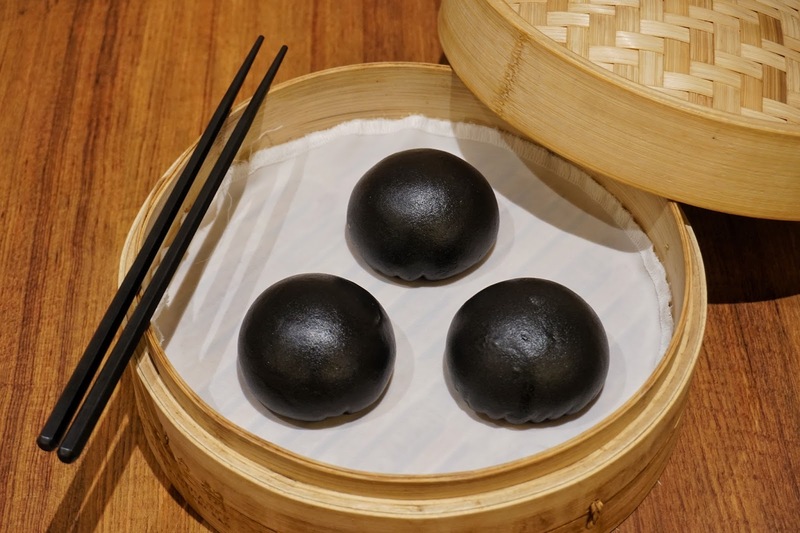 A visit to Paradise Dynasty would not be complete without having xiao long bao. 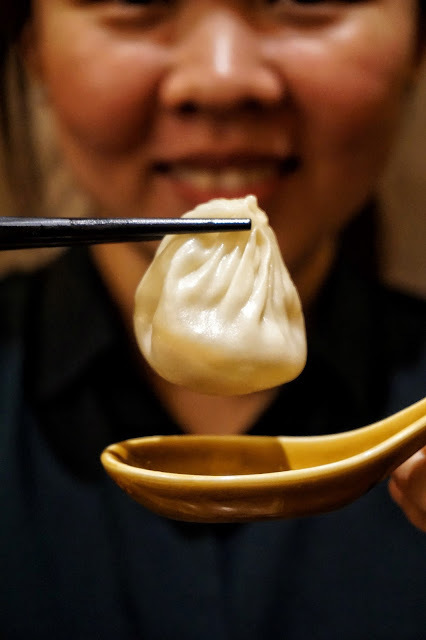 I still remember the first time I had Paradise Dynasty's Signature Xiao Long Bao (PHP188, 6 pieces | PHP298, 10 pieces) like it was yesterday. It was love at first bite and I regretted only ordering 6 pieces instead of 10. The broth and pork were spot on that I didn't have to rely on black vinegar for extra taste. 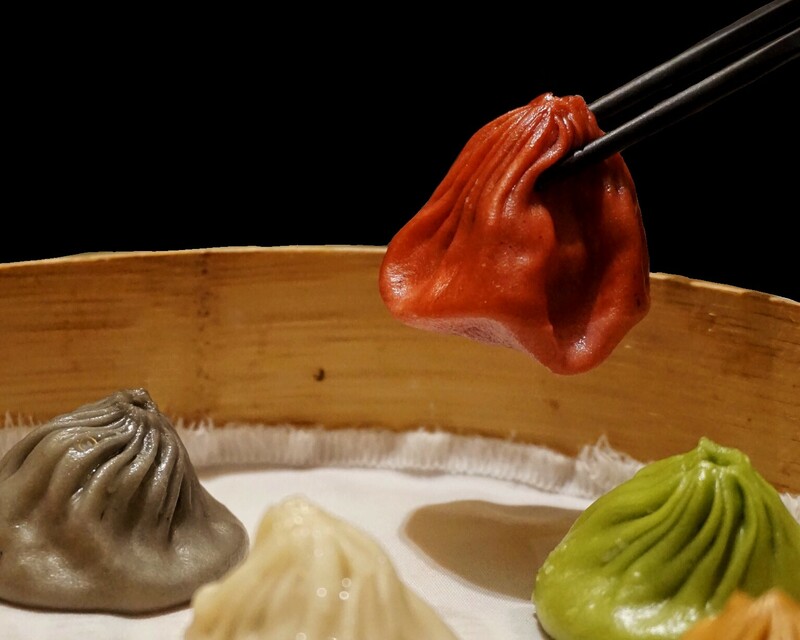 If you are feeling a bit more adventurous, go for Special Dynasty Xiao Long Bao (PHP388) which has 8 different xiao long bao flavors. Aside from Signature, other flavors are garlic, ginseng, foie gras, black truffle, crab roe, cheese and Szechuan. 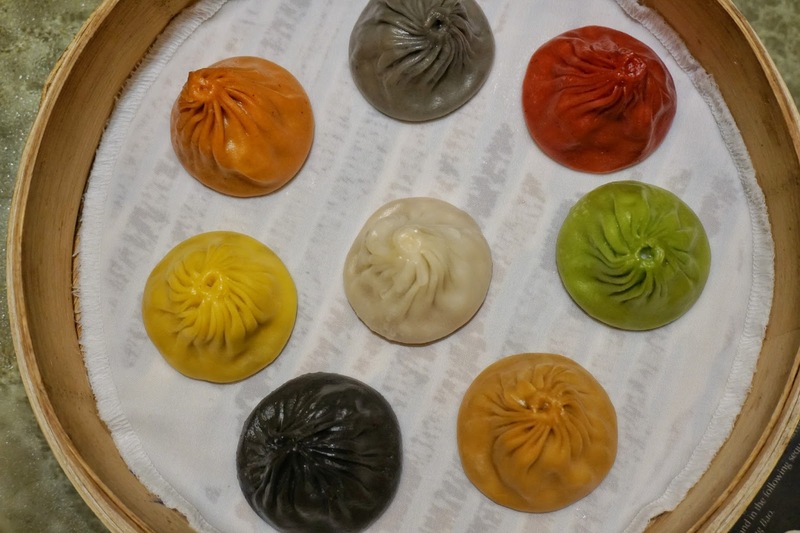 Paradise Dynasty's flavored xiao long bao are lot cheaper compared to other restaurant and believe me, it does not disappoint. 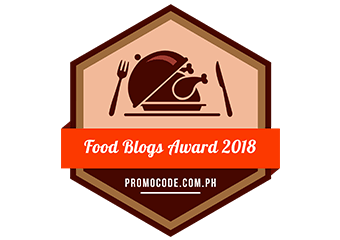 I've tried black truffle, garlic, foie gras and crab roe before and I was impressed how it could keep up with its counterparts while offering it at a pocket friendly price. But for this visit, I tried the intimidating Szechuan. It took a lot of courage before I managed to pick up my chopsticks to get this one. Known to be the spicy one in the bunch, I usually ignore this despite it whispering, "Eat me, I know you want to know how hot I am." 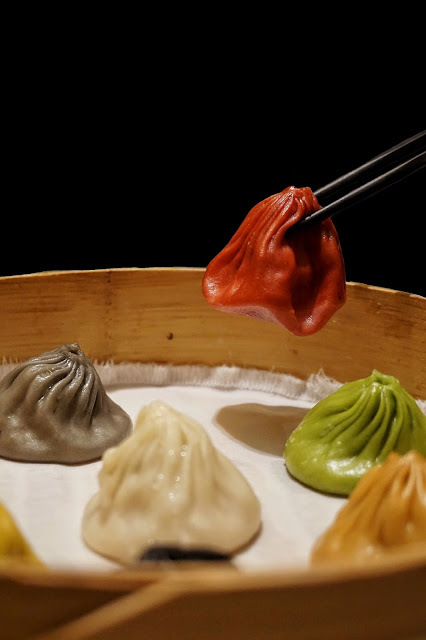 And finally, that red xiao long bao won. But I was surprised that it was not as spicy as I thought. 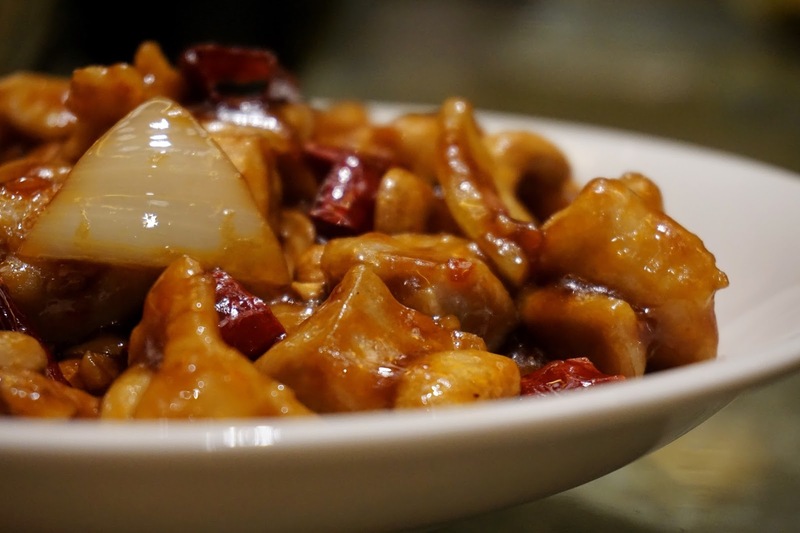 In fact, it was pretty mild considering it is called Szechuan. 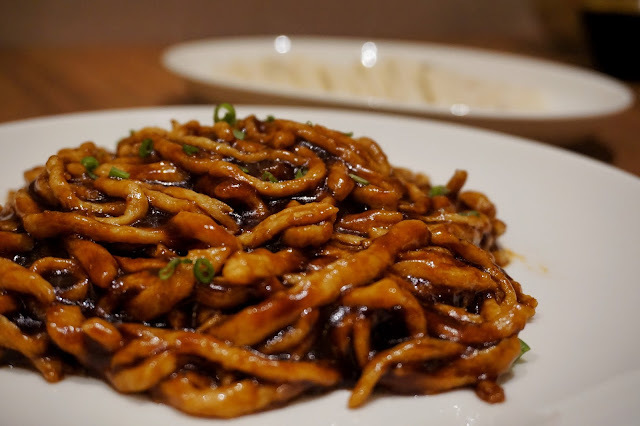 Another new dish currently exclusive to Paradise Dynasty is Stir-fried Shredded Pork in Black Bean Sauces served with Chinese Crepes (PHP388). Don't be fooled by what seems to be noodles as these are thin rolls of pork. 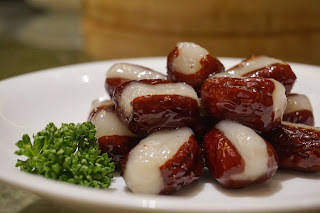 Imagine ground pork but thinner and longer. Eaten like minced Peking Duck, this savory yet sweet dish is a nice and fun dish to have when with family or friends. Chicken lovers would enjoy this plate of Kung Pao Chicken (PHP298). This mildly spiced dish is packed with flavors and though it's okay to be eaten as is, I prefer to have this with a bowl of rice. 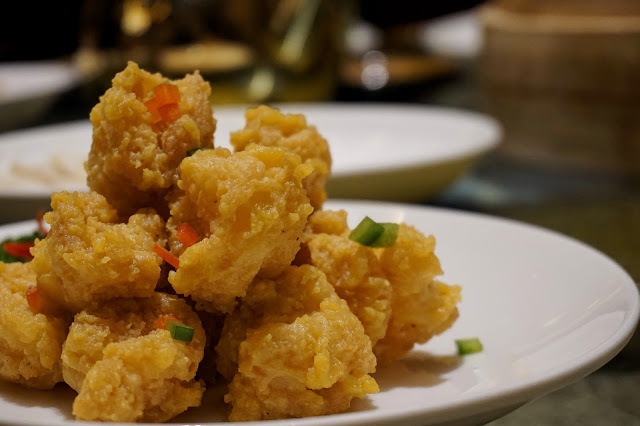 If seafood is what you fancy, then do try this branch's bestseller Crispy-fried Crystal Prawns tossed in Salted Egg Yolk (PHP588) or Poached Sliced Fish in Szechuan Chili Oil (PHP788) for extra heat. Battered prawn in salted egg yolk is not exactly a new dish as several other restaurants offer this as well. But Paradise Dynasty's version stood out because of its use of huge fresh prawns and generous serving of salted egg sauce making each bite packed with flavor and crunch. I didn't try the very intimidating bowl of soup made with poached sliced fish in Szechuan chili oil. I was told that this one is packed with spice that it could clear one's stuffy nose. And if you happen to be allergic to seafood but simply cannot resist it, go with Scrambled Egg White with Fish and Conpoy (PHP328). 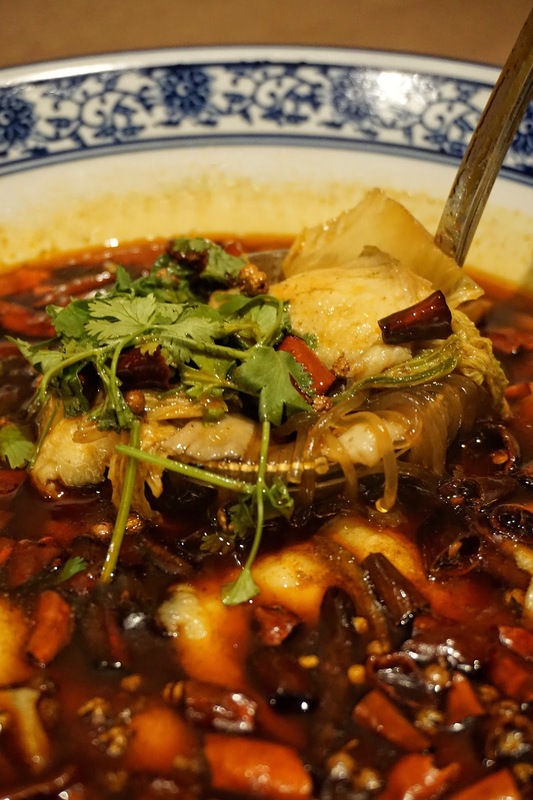 This dish was said to have originated centuries ago when an Empress Dowager wanted to have a crab dish. 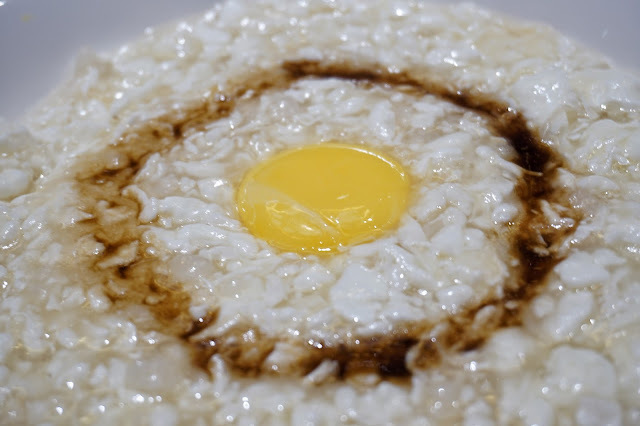 However, the chefs couldn't find any and made do with an alternative instead by using egg white and fish with a crab-like texture. And true enough, its texture would make you think it is crab. La Mian with Scallion (PHP200) was pretty good too. 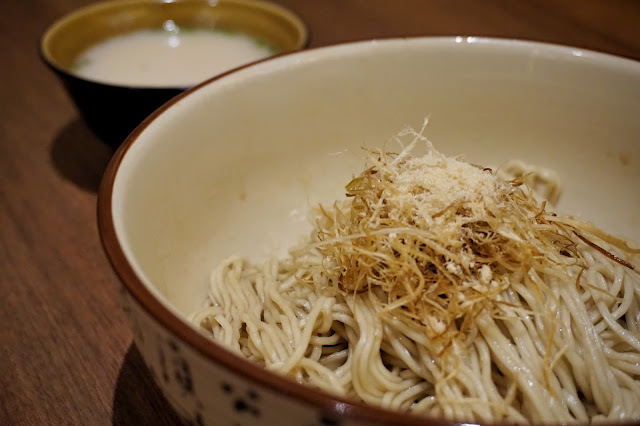 I enjoyed its light flavor which would go well with the other dishes with richer flavors. 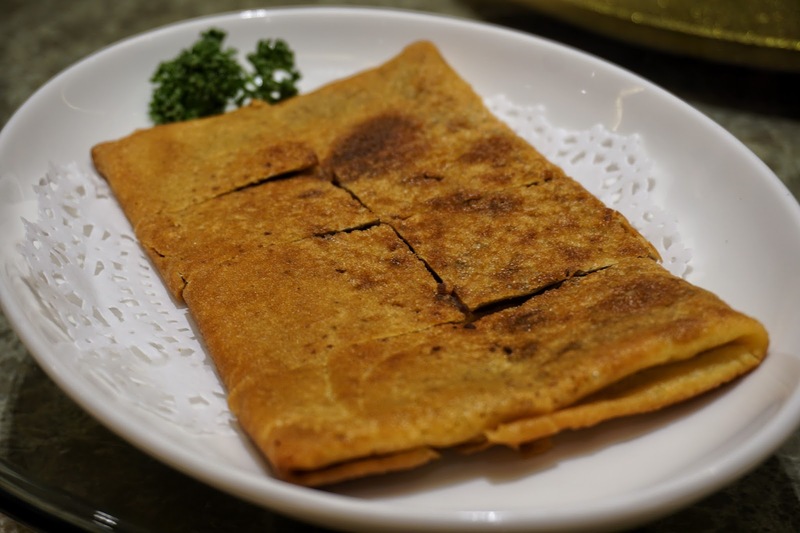 To cap our meal, I indulged in a slice of Pan-Fried Pancake with Red Bean Paste (PHP168). This dessert doesn't look very appealing but skipping this would be a mistake. Think of flat and crispy buchi without sesame seeds and mochi, instead the red bean is wrapped in thin and crisp crepe like wrapper. We definitely took our time to savor each dish that we didn't even realize that it was already 3 p.m. when we finished our lunch. 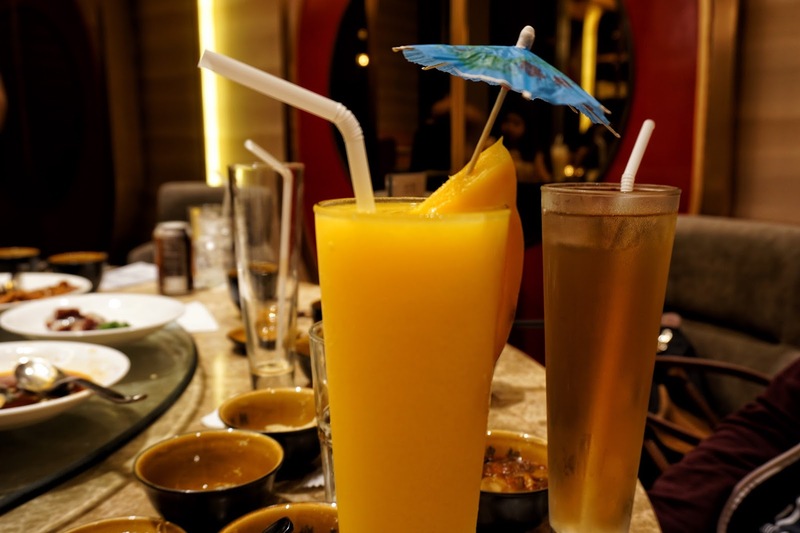 Paradise Dynasty is located at 2nd Floor, Podium Mall, ADB Avenue, Ortigas Center, Pasig City. This "review" of Paradise Dynasty is wonderful. 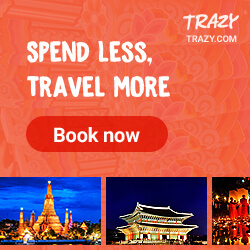 Got here from a link on zomato.com. Definitely something to try next time I visit Ortigas. Or . . . the Philippines for that matter. I was looking for a place that could serve a group of 12-15 people for a birthday dinner celebration and wanted to know if Paradise Dynasty accepts group reservations. Or if the menu has entrees suitable for groups.